Since March, YouTubers have watched their revenue plummet as advertisers bleed out of the platform. Some videos containing violence, real or fictional, are considered “inappropriate for advertising.” First-person shooter Call of Duty, a massively popular game on YouTube, is no walk in the park. So, the huge community that’s formed around it is getting hit by widespread demonetization. 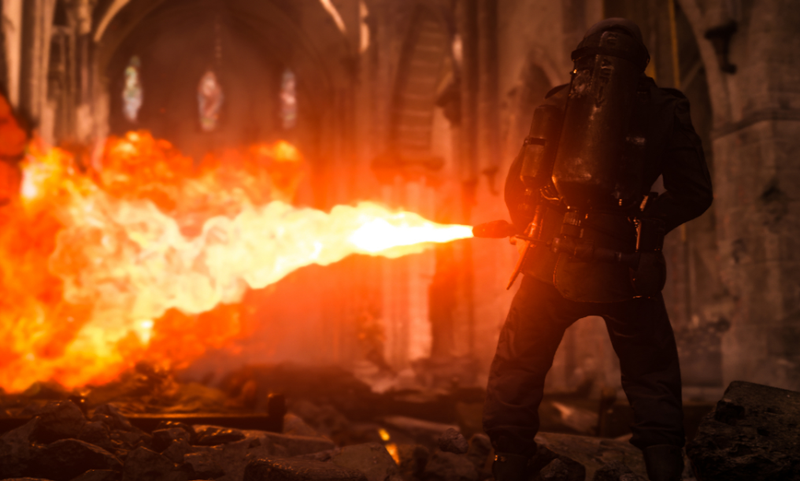 After Activision announced upcoming Call of Duty title, Call of Duty: WWII last week, the community’s financial problems took a turn for the worse. Viewers and fans want to hear about the next CoD game, but as a result of its WWII theme, YouTubers are risking demonetization by talking about it. PrestigeIsKey, a Call of Duty YouTuber with over a million subscribers, published a video on Sunday about how his channel is struggling with demonetization. “At first,” he said, “I thought this wouldn’t affect gamers because, obviously, video games aren’t real.” Throughout his seven years making CoD content on YouTube, he’d never had an issue until recently. Months ago, when the demonetization crisis was in full swing, his channel suffered enormously because it depicts fictional war. When asked about whether ad-friendly filters can tell the difference between real and video game violence, a YouTube representative referred me to a blog about how YouTube’s having more positive conversations with advertisers. To make money again, YouTube suggests making more advertiser-friendly content. For YouTubers like ChaosXSilencer, who’s been making CoD videos for five years, rebranding his channel is out of the question: his fans come for the first-person shooters. Before he carved out a full-time job on YouTube, he ran a Papa Johns in Arkansas and, before now, he’d never had any financial problems making a living on YouTube. The Call of Duty community, he says, is having a lot of issues—and especially now that the big story is CoD: WWII. ChaosXSilencer said that it’s risky to cover the new CoD title, even though it’s what viewers want. PrestigeIsKey tried an experiment where he made a two-minute video about how his milk expired and compared it to one about the upcoming CoD game. The milk video didn’t get half as much watch time or a third as many views, allegedly earning four times more money. YouTube would not confirm or deny whether Call of Duty YouTubers are disproportionately affected by the demonetization wave. Anecdotally, it seems to be a major issue throughout the community. CoD YouTubers feed their families on this money. It’s their trade. Call of Duty YouTuber 402THUNDER402 doesn’t pity his peers, though. In a recent video about ad-friendly content, he said “The party is over. I hope YouTubers saved your money.” He thinks it’s stupid for CoD YouTubers to depend exclusively on YouTube. Now, some might have to leave the platform and pursue another line of work. In the comments of his recent video, PrestigeIsKey referred fans to his Patreon page. “If it comes down to it I will have to put YT in the background while making sure to support my family,” he said.